From its humble beginnings in 1978, the MAG Group has grown into a multinational conglomerate that encompasses more than 50 companies and 2,000 people across the globe. Moafaq Ahmed Al Gaddah, the Chairman of the group, has built an empire that spans a myriad of trades including real estate, education, manufacturing and automotive parts, and who continues to build on his legacy with revolutionary projects and innovative ventures. Underpinned by his outstanding foresight and business acumen, the group’s vision has always been to achieve economic growth without compromising quality or moral standards. This vision can be found embodied in all their developments. Moafaq Al Gaddah has successfully turned MAG Group Holding into one of the most awarded and celebrated companies in the region, having developed multiple award-winning projects, including the Emirates Financial Towers that earned a Guinness World Record in 2013. Entrepreneur of the Year Arabian Business Achievement Awards in 2006. Title of Ambassador of The Arab Family Arabic Family Association Ranked Among The Fifty Wealthiest Arabs in 2007. 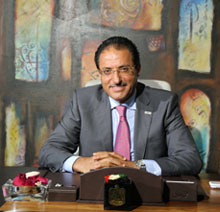 Moafaq Al Gaddah Appointed to The World Finance 100 List World Finance in 2012. Ranked 16th most influential Arab Arabian Business Power 500 in 2012. Title of Ambassador of The Arab Family Arabic Family Association in 2012. Certificate of Recognition University Leadership Consortium in 2016. Golden Shield Of Recognition Arabic Institution for Social Responsibility in 2016. Certificate of Thanks and Appreciation The Consulate General of The Syrian Arab Republic In Dubai in 2016. Certificate of Philanthropic Recognition .The University of Balamand In Dubai in 2016. Leading Business Entrepreneur of The Year Award Sharjah Chamber of Commerce and Industry in 2016. ABLF Business Excellence Award .Asian Business Leadership Forum (ABLF) in 2017. Award For Outstanding Contribution Arabian Business Real Estate Awards in 2017. MAG 5 RESIDENCES Abu Dhabi. MAG 214 Jumeirah Lakes Towers. AL QUOZ WAREHOUSES Al Quoz, Dubai. THE POLO TOWNHOUSES Meydan, Dubai. THE POLO RESIDENCE Meydan, Dubai. MAG 230 .City Of Arabia. MBL RESIDENCE. Jumeirah Lake Towers. MAG CREEK WELLBEING RESORT DHCC PHASE II. MAG 612 .Jumeirah Village Circle, Dubai. MAG 5 DUBAI SOUTH .Dubai South. THE ESTATE Al Furjan, Dubai. THE AVENUE TOWER .International City, Dubai. IGO 101 Jumeirah Lakes Towers, Dubai. THE VERT Business Bay, Dubai. ART CENTRE Al Barsha 2, Dubai. Contributed to the European International University. Consistent scholarship and financial support contributor, especially to Arabs living in Dubai. Member of the World Economic Forum (Davos) since 2009. Contributed to provide aid and material support to all clubs and associations of the disabled.